Leaving my house, I feel the breeze whip my hair across my face. In the treetops, a gusty wind plays, spinning leaves through the air like dangerous thoughts. What on earth did we invite, when we said we would do a ritual for grief? I’ve been feeling out of sorts all day. Activated. Unable to focus. As though something is stirring in my deep self. When I finally get to speak to Cheryl, my co-host, she says she has been thinking of cancelling, so great is her own sense of disturbance. But as well as being a little scary, it is exciting. What’s the worst that could happen? That we might feel sad? Shed a few tears? And what is the best thing that could happen? Some form of liberation? We choose liberation over comfort. Over Cheryl’s garden, the sky hovers gray and foreboding. We consider gathering our circle inside and begin to move the chairs around, but I am drawn back to the trees. To the green grass and the billowing clouds. Nature is a part of this show and will not be excluded. We set blankets on the cool ground and our centrepiece statue in place. 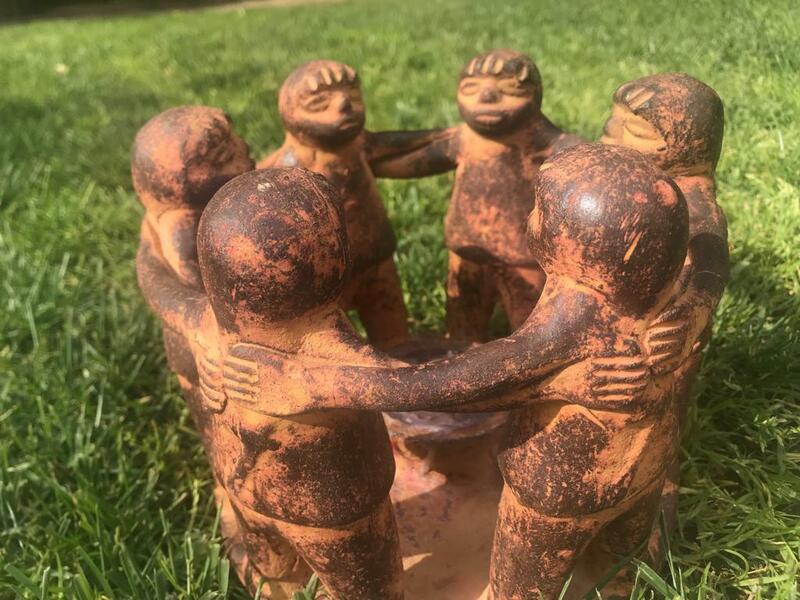 Recently acquired, it is a sculpture of people standing together, holding each other in circle. Flat hands against each other bodies, they touch the heart chakra where it opens in the back of the body. It will be our emblem for this evening. As women arrive, I find myself making my singing bowl sound a long, mournful note. Mentally, I am calling in the ancestors. Calling in the spirits of this place. Calling in all those who need to witness this happening. They float in silently, taking their seat in the circle. The details of this ritual ceremony are unimportant. We made them up, suiting them to our purpose. For we are orphans of spiritual practice. We have grown up in traditions depleted of meaning and have sought out significance in different places, different religions, in cultures other than our own. No matter. Our intention is to gather in service of our own inner path. To give voice to that which needs to speak. To listen faithfully to what is said. These intentions are what guides hand and heart. At the end of the evening, we stand for a moment, mirroring the statue, holding each other in a sacred circle of trust and care, before heading inside to drink hot tea and eat cake. 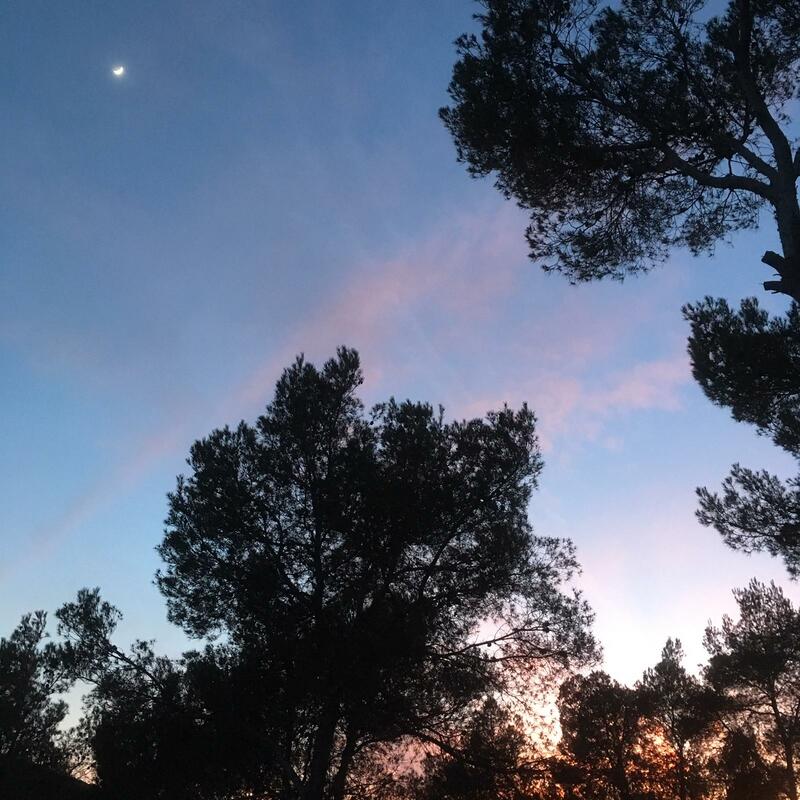 In this way, we follow the path of witches and shamans as they ground the energies of their practice and feed life, but really, don’t all good gatherings end with food and drink? The wisdoms we seek are grown within human bodies and cannot be known outside of our embodiment. About this simple fact, the Buddha was clear, but we are not only Buddhist, not only pagan. Following the Christian tradition of Maundy Thursday, we make an offering to charitable causes and I feel a profound awareness of the cycle of giving and receiving. Without opening to give, we remain closed to possibilities of receiving. In bed that night, I feel my heart settle into a peacefulness that comes from knowing I have been met well. I have connected. With my own deep self, with my friends on this inner path and with Mother Nature herself. The wind has dropped. The trees are still. I sleep the sleep of the blessed.